Not long ago, there was a rumor that Microsoft was going to announce a feature called SmartGlass for tablets and phones at E3, allowing users to interact with content on the Xbox using their "second-screen" devices. Well, that rumor has panned out to be true; during its E3 keynote, Microsoft did officially announce the service. The first thing they demonstrated was the ability to watch movies on multiple devices, seamlessly. Basically, you could watch something on one device and easily transfer the film to another, picking up from where you left off easily. The ability to indulge in tasty bonus content pertaining to the film or show that you’re watching was also demonstrated; they did so with Game of Thrones, touting that you’ll be able to see cool facts and information about the episode on your device while you watch. 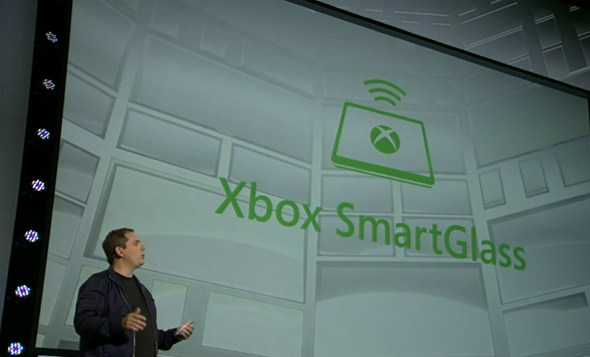 The Xbox’s TV entertainment side isn’t the only part of the device that will take advantage of SmartGlass; they also showed off some gaming-related applications for the technology. On top of the bonus content that can be offered, relevant to your what you’re doing in the game. In some cases, you may even be able to interact relevantly with the game. They showcased the ability to make plays in football games as one example of this. 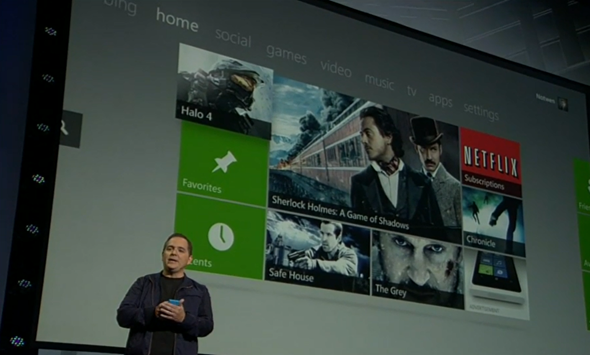 And finally, they showed how SmartGlass – along with Kinect commands – will help users better use the web on the Xbox. Pointing out the awkwardness of using a keyboard in the living room, Microsoft went on to show that users can use SmartGlass to interact with web pages by using their mobile phone as a touchpad of sorts. You could use your finger to move a cursor around, tap-to-click, and even use gestures such as pinch to zoom. As I and several others on Twitter noticed, it did appear that the demo of this was not performed live, as his fingers did not seem to be synchronized with what was happening on screen. Nevertheless, the tech still did look pretty cool. SmartGlass will work with iOS "second-screen" tablets and phones on top of Windows 8/Windows Phone devices. I wonder how consumers would take to the technology; sure, while watching something on TV people can at times be glued to their tablets and smartphones, but for different reasons. Perhaps the ability to also view bonus content would be pretty cool. Now, I’m less sure that people would take well to interacting with games using their other devices; it seems rather pointless and unnecessary.